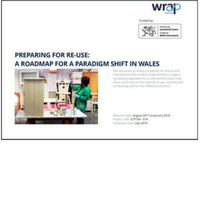 A new report by Resource Futures for WRAP Cymru and the Welsh government sets out a road map for a transformative shift in the way Wales deals with waste, through increasing re-use, and what this could mean for the environment and economy. As well as reducing waste and environmental benefits, preparing waste for re-use can create jobs and save money for councils and citizens alike. 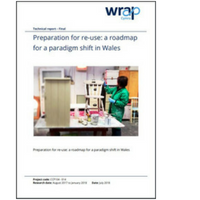 The Roadmap estimates the impact that increased preparation for re-use would have on the wider Welsh economy. As well as looking at the impact on the national re-use, recycling and composting rate, the Roadmap presents the outputs of modelling to estimate the impact with regard to: jobs and volunteer posts created; avoided greenhouse gas (GHG) emissions; and direct and indirect added value to the economy resulting from increased preparation for re-use activity. It presents a view on the level of action and intervention that would be needed to achieve different levels of preparation for re-use, including a transformative paradigm shift in Wales.